2018 marks the 26th anniversary of the founding of The Feltre School! Over the past quarter century--very much-- has happened. We have grown from a 100 sq. ft. planning office in Winnetka, to a small classroom in Evanston, to our building on Erie Street (for 18 years! 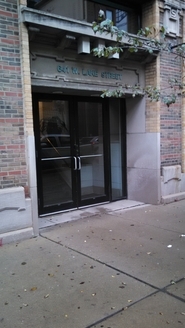 ), and this year to our new headquarters at Literacenter at 641 W. Lake Street. And we have grown in the work we do, from helping a few students read better to offering classes in grammar and composition, logic and philosophy. Who could have predicted that our founding would eventuate in the gathering of dozens of volunteers, hundreds of supporters and friends, and thousands of students. We are grateful to all of you who have been a part of our work. The students and friends who pass through our doors come from all walks of life and from all backgrounds. They come seeking to learn how language works, to appreciate better the principles of grammar and logic and rhetoric, and to discuss the great questions of philosophy that have engaged people for all time. And that, ultimately, is exactly what we set out to do: to provide a place where it is possible to deepen our humanity through conscious ways of thinking. We are nearing the end of our third decade of work. As the times change so must an institution that intends to enrich the cultural and intellectual lives of those who seek it out. Please consider a gift of any size so that we may continue to preserve and promote the study of the essential liberal arts, to bring a richer sense of shared humanity to our students, and to work with our friends to make life that much more meaningful for all who pass through these doors. It has been the generous support of those who understand the importance of our work that has kept Feltre going over these past 26 years. Please help us continue the tradition. You may use Paypal by clicking on the "Donate" button below, or download a PDF of our annual fund pledge form below, fill it out and mail it to us. Thank you.